The prairies of North America once covered vast stretches of land, with towering grasses creating ideal nesting and forage habitat for grassland birds. But the deep, rich soil and treeless expanse also represented the ideal conditions for farming—both row crops and cattle grazing—in the eyes of settlers. Today, largely thanks to agricultural conversion, a mere 1 percent of tallgrass prairie remains. And what's left is now being threatened by invasive species and forest encroachment. "With grasslands in steep decline, the birds that depend on them are also disappearing. Therefore, it is urgent that we understand how these more recent changes—invasive species and landscape shifts—influence grassland bird reproduction," says Scott Maresh Nelson, a doctoral student advised by Professor Jim Miller in the Department of Natural Resources and Environmental Sciences (NRES) at the University of Illinois. 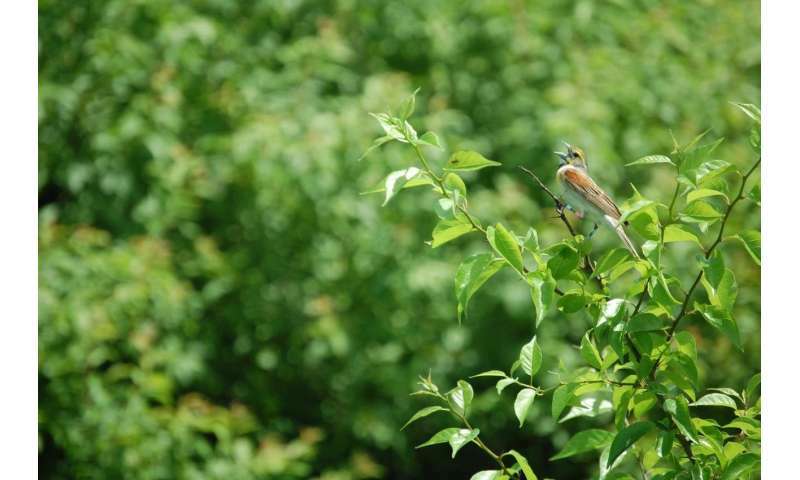 In their Iowa-based study, the researchers identified all the plants within a 16-foot radius of every dickcissel nest they found—all 477 of them—and the more tall fescue there was, the greater the chances of nest failure. No other plant in their surveys had significant predictive power.